AD Piston Ring has specialized in producing cast iron piston rings since 1921. Due to the wear-resistance of the material, cast iron piston rings are used in a broad range of engine applications. In addition, cast iron piston rings are provide the most consistent pressure against the bore. We custom build cast iron piston rings ranging in size from 1” to 30”. AD Piston Ring manufactures cast iron piston rings with a variety of joint configurations for various applications. In addition, all cast iron piston rings are wax coated for protection from corrosion. With the ability to manufacture quantities from a single cast iron piston ring for repair shops to producing large quantity of cast iron piston rings for OEM customers, AD Piston Ring is able to address all customers’ needs. All cast iron piston rings are manufactured-to-order to our customers’ specifications. 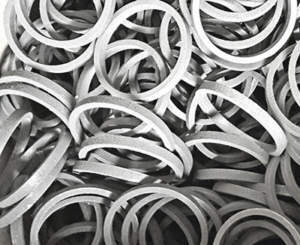 Whether it be oversize piston rings or metric piston ring sizes, we can manufacture to suit your needs. Highly customized, precision ground cast iron piston rings for applications ranging from diesel engines and collector cars, to locomotive, marine, compressor, engines and hydraulic cylinders are our specialty. With our manufacturing process, we are able to deliver high quality cast iron piston rings without excessive lead times. In some cases, cast iron piston rings can be completed and shipped in as little as 1-2 business days. Ask us about our expedites!